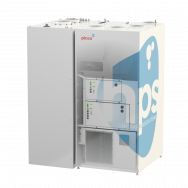 The first system from HPS, Picea, combines energy storage, heating support and indoor ventilation in one compact system. Thanks to its high-performance energy management system, Picea is able to meet the complete electrical energy needs of a family home. In addition, all waste heat produced is used to provide the house with heat and hot water, thus lowering the cost of heating. Compared to commercially available battery solutions, Picea has a hundred times more storage capacity with twice the output. Picea is energy efficient and provides energy in all seasons. This allows Picea to provide complete energy self-supply and independence from the grid. The energy produced by the photovoltaic installation on sunny days can either be used straightaway, or converted into hydrogen and stored. This energy is then made available at night or during the winter when there is little or no sunshine. The HPS system’s fuel cell converts the energy stored as hydrogen back into electrical energy and heat as needed. Berlin, Germany, 1 March 2018 – HPS Home Power Solutions GmbH (HPS), the Berlin-based energy solutions provider for single-family homes which fulfils the need for energy independence, will be presenting Picea, the world's first all-in-one unit to supply year-round power from the consumer’s own photovoltaic system, at trade fairs in March and April. SHK ESSEN is Germany’s largest trade fair for the sectors sanitation, heating, air conditioning and renewable energies and is the first specialist trade fair of the year for the presentation of market-ready innovations. More than 550 international exhibitors and about 48,500 trade visitors come together to discuss trends and developments in the SHK sector. SHK Essen takes place from 6-9 March 2018 and opens daily from 9am to 6pm CET from 6-8 March 2018 and from 9am to 4pm CET on 9 March 2018. Additional information on the trade fair presence of HPS can be found here. ENERGY STORAGE EUROPE is an international conference and trade fair for energy storage and is one of the world's leading platforms of the energy storage industry. More than 160 exhibitors, companies and research institutions present themselves to over 4,000 visitors with the latest products and research results. ENERGY STORAGE EUROPE takes place from 13-15 March 2018 and opens daily on 13 and 14 March 2018 from 9am to 6pm CET and on 15 March 2018 from 9am to 5pm. Additional information on the trade fair presence of HPS can be found here. Hannover Messe is one of the world's most important industrial fairs, where international companies present their innovative ideas, key technologies, as well as products in the areas of research and development, industrial automation, IT, supply, production technologies and services as well as energy and mobility technologies. Hannover Messe opens for its about 6,500 exhibitors and 200,000 trade visitors from 23-27 April 2018 daily from 9am to 6pm CET. Additional information on the trade fair presence of HPS can be found here. 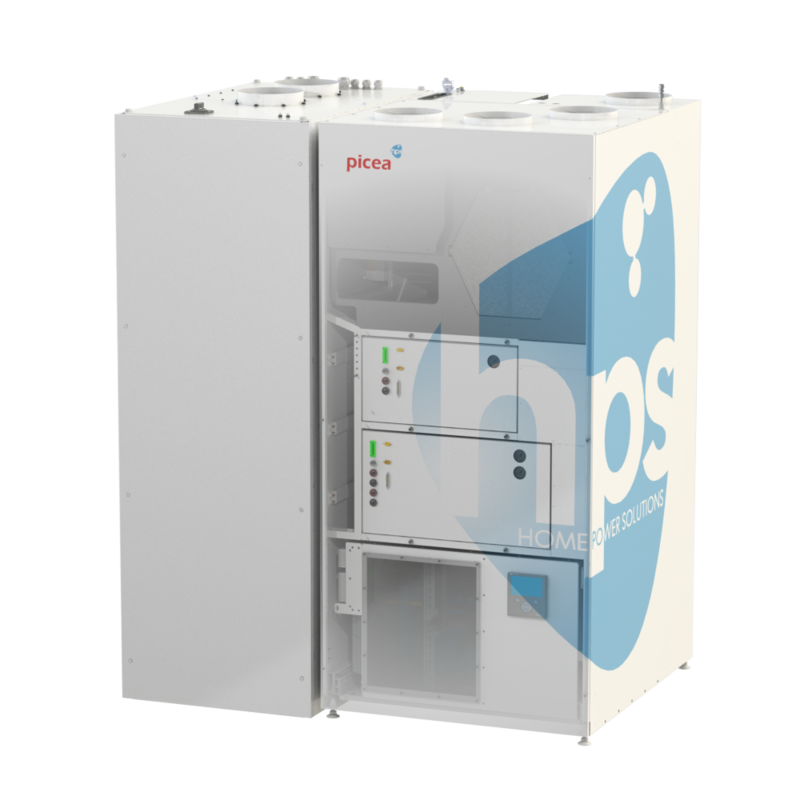 Berlin, Germany, 16 February 2018 – HPS Home Power Solutions GmbH (HPS), the Berlin-based energy solutions provider for single and multi-family homes which fulfils the need for energy independence, today announced the official start of sales and distribution of the energy storage system Picea, the world's first all-in-one unit to supply year-round power from the consumer’s own photovoltaic system, beginning in March. Customer orders will be recorded in a waiting list as of 1 March 2018. The first systems will be delivered from the fourth quarter 2018. The price for the first 50 Picea systems starts at EUR 54,000 excl. VAT for the launch campaign. Picea is individually configured according to location, power requirements and features, which can affect individual pricing. Installation costs due to varying requirements onsite will be charged separately by the distribution partners, in line with usual practice. Sales and delivery service as well as maintenance will be carried out by qualified distribution partners throughout Germany. Over the next months, HPS will qualify and train partner companies throughout Germany. The first partner meeting takes place in Berlin in February 2018. Additional dates and corresponding training will follow during the year. Picea requires little maintenance and is designed for easy installation. The partner companies will be well prepared for the distribution and delivery of the first Picea systems. Picea will be available in the fourth quarter 2018 after years of development and successful field testing. The target markets for Picea are both private new buildings and existing buildings. Picea can be installed both in smaller single households as well as family households. Due to the high level of interest, that already exists today, even before the sales start, a waiting list has been set up to ensure customers priority in the delivery of the first Picea systems, after a qualification of the construction project and the schedule. Picea is an all-in-one energy storage system: energy storage, heating support and indoor ventilation in one compact system. Thanks to its high-performance energy management system, Picea is able to meet the complete electrical energy needs of a family home. In addition, all waste heat produced is used to provide the house with heat, thus lowering the costs of heating. Picea can be combined with all commercially available heating units and technologies. Compared to commercially available battery solutions, Picea has a hundred times more storage capacity with twice the output. Picea is energy efficient and provides energy in all seasons. This allows Picea to provide complete energy self-supply and independence from the grid.